Compact, pyramidal; height 50' to 60', diameter 24" to 36"; trunk often twisted, strongly tapered, and frequently divided into two or more direct stems; branches short and nearly horizontal; sometimes forms almost impenetrable thickets because dead branches are very stiff and persistent; in the open, develops a conical, symmetrical crown. 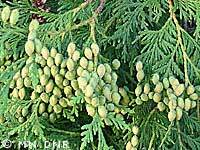 There are numerous ornamental or garden varieties of white cedar known as arborvitae. Gray to reddish brown, separating in long, vertical, narrow shreddy strips. 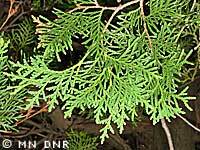 Scalelike; green to yellowish green; length 1/8" to 1/4", arranged to make the small branches flat; pleasant, aromatic scent when crushed; pungent to the taste. Small, oblong cone ripens in the fall of the first year; yellowish brown; size about 1/2" with six to 12 scales borne singly or in large clusters on ends of branches. Northern part of the state; usually grows in moist places where it is often found in dense pure stands; sometimes found on rather stony ground, singly or in small clumps as far south as Winona County; shade tolerant.